Amazon has unveiled their new Android Tablet and it sells for just $199 for a 7″ multi-touch display. The tablet can use wifi but not cell phone signals to access the internet. Just this week, Amazon, also announced the large amount of content, available to USA Amazon customers only, that subscribe to Amazon Prime. I never really cared about faster shipping but features like a large library of content available for free streaming of 10,000 movies and TV shows makes the package very attractive, I think. 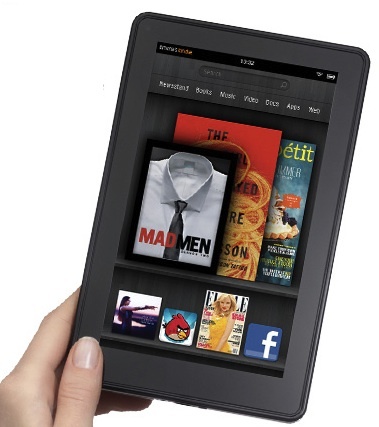 The Kindle Fire is another in the long list of innovations from Amazon. I am very impressed with their management, leadership and willingness to focus on the long term and take risks with their investments. The Amazon Fire has a heavily Amazon modified Android operating system. Amazon doesn’t do a good job of explaining what the limits on their marketing material the share really are. They hide how few people really have access to some features (like saying “18 million movies, TV shows, songs, magazines, and books” – without mentioning much of that is available to less than 5% of the population). Since they don’t make that clear, it is hard to know what other limitations they don’t make clear so outside the USA (95% of the population) you are on your own to guess what features are really available to you. It has most of the features you would expect of a Android tablet: the ability to use the internet, app market, etc. Unlike the previous Kindle options this offers color touch screen. Amazon is keeping the digital ink Kindle’s as their suggested book reading choice. Heavy users of the book reading function will likely keep a Kindle digital ink device. But the new device can also serve as a book reader, there are limitations of the current color technology that mean it just isn’t as great for long hours of book reading. Amazon is touting the “cloud-accelerated” browser which does sound like a worthwhile innovation taking advantage of their Amazon Web Services cloud (AWS). The Amazon Silk browser is different in a radical new way. When you use Silk, without thinking about it or doing anything explicit, you’re calling on the computing speed and power of the AWS. We’ve refactored and rebuilt the browser software stack to push pieces of the computation into the AWS cloud. This lets Silk do more work, more quickly, and all at once. Silk browser software resides both on Kindle Fire and on the massive server fleet that comprises the Amazon Elastic Compute Cloud (Amazon EC2). With each page request, Silk dynamically determines a division of labor between the mobile hardware and Amazon EC2 (i.e. which browser sub-components run where) that takes into consideration factors like network conditions, page complexity and the location of any cached content. Amazon EC2 is always connected to the backbone of the Internet where round-trip latency is 5 milliseconds or less to most web sites rather than the 100 milliseconds that’s typical over wireless connections. AWS also has peering relationships with major internet service providers, and many top sites are hosted on EC2. This means that many web requests will never leave the extended infrastructure of AWS, reducing transit times to only a few milliseconds. This is good, latency is an important, and often overlooked technical issue. It also seems a bit misleading, I think the latency your device experiences interacting with the cloud is higher (the technical details Amazon is touting are talking about communication within the cloud – which is good and helpful, just not quite as good as it sounds). The silk browser technology looks to be a very big innovation that will be very useful. The price of the Amazon Kindle Fire Tablet illustrates once again that Amazon is still practicing what Jeff Bezos’ believes: driving down costs to customers and customer focus. There are two kinds of companies, those that work to try to charge more and those that work to charge less. The display on the Kindle Fire is 7″ multi-touch display with IPS (in-plane switching) technology and anti-reflective treatment, 1024 x 600 pixel resolution at 169 ppi, 16 million colors. And the full device size is 7.5″ x 4.7″ x 0.45″ (190 mm x 120 mm x 11.4 mm). Weighing 14.6 ounces (413 grams). Fully charges in approximately 4 hours via included U.S. power adapter. Also supports charging from your computer via USB. Fully charged it will support 8 hours of continuous reading and 7 1/2 hours of video playback. Amazon Fire comes with 8GB of internal memory (essentially the hard drive). That’s enough for 80 apps, plus either 10 movies or 800 songs or 6,000 books. Supports public and private Wi-Fi networks or hotspots that use the 802.11b, 802.11g, 802.11n, or 802.1X standard with support for WEP, WPA and WPA2 security using password authentication; does not support connecting to ad-hoc (or peer-to-peer) Wi-Fi networks. Document formats the Kindle Fire can read: Kindle (AZW), TXT, PDF, unprotected MOBI, PRC natively, Audible (Audible Enhanced (AA, AAX)), DOC, DOCX, JPEG, GIF, PNG, BMP, non-DRM AAC, MP3, MIDI, OGG, WAV, MP4, VP8. For those wondering it is a stand alone device that does not require a computer. This entry was posted in computer, internet and tagged Amazon, computer, internet, tablet by curiouscat. Bookmark the permalink. Now that the iPhone 4S has a better antenna, I’m kissing my iPhone 4’s death grip goodbye. I checked out the offers for an iPhone 4 32G Verizon in mint condition and here’s what I got: $268 (Cash for iPhones), $204 (Gazelle) and $250 (Totem). Will definitely sell mine to the actual top bidder. So excited to see how Siri will blow my mind! Can’t help but give in to the 8 megapixel camera of the new iPhone 4S. I’m ditching my iPhone 3GS 16 GB for $171. I can’t believe that Cash for iPhones is offering me this much considering that my device is OLD. Turns out that iPhones do have a high resale value compared to other smart phones – I’d say it’s worth the money I spent 2 years ago! Cash for iPhones is offering me $294 for my iPhone 4 16GB AT&T but I’m thinking if I should sell it on eBay and put up with the waiting. Pre-order starts this October 7 already and I’m hoping for quicker cash. I wonder which option is faster in terms of getting rid of my old iPhone? Cash for iPhones is offering me $294 for my iPhone 4 16GB AT&T but I’m thinking if I should sell it on eBay and put up with the waiting. Pre-order starts already and I’m hoping for quicker cash. I wonder which option is faster in terms of getting rid of my old iPhone?